Fito Conesa, Pere Llobera, Pedro Magalhaes, Mafalda Santos, Zoé T. Vizcaíno. The colloquial and journalistic use of the phrase “the beginning of the end”, so frequently employed to imply dramatic anticipation or wishful yearning, directly refers to the moment of foresight that allows us to progress towards events and predict what has not yet occurred. An erroneous thought that affects our ability to react in the face of certain circumstances, be they personal or social, insignificant or grandiloquent, real or imagined, accelerates because of the growing need to reach the right conclusion. O começo do fim –a literal translation to Portuguese of “the beginning of the end” and a clear nod to the dialectical interplay between the Portuguese and Spanish art scenes as suggested by Jugada a Tres Bandas– is an expository essay in which the works of Fito Conesa, Pere Llobera, Pedro Magalhães, Mafalda Santos y Zoé T. Vizcaíno offer diverse conceptual and formal approaches to the idea of augury in art. This exhibit attempts to tell five independent and complementary stories (one by each artist) that invite the observer to make a chaptered journey through the rooms of the Eva Ruiz gallery. 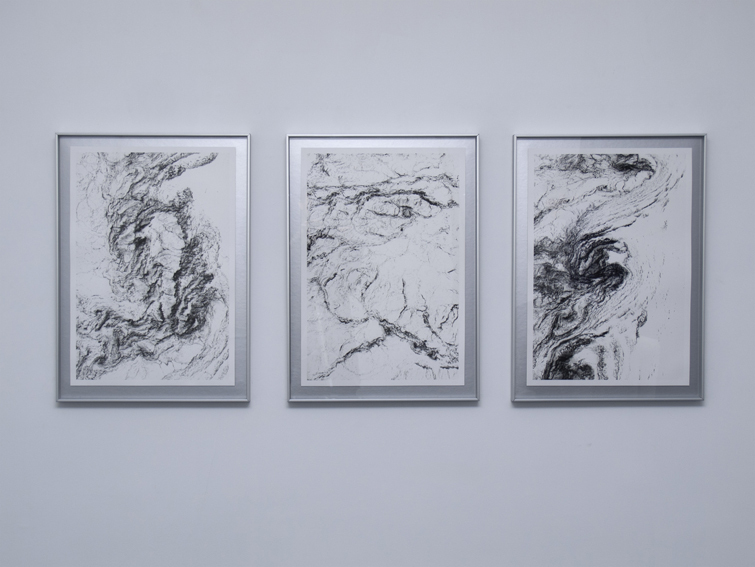 A visual narration that employs diverse mediums of presentation –video, installation, photography, painting or text– to analyze the feeling of perplexity and confusion derived from the premonition of finality. O começo do fim has as its point of departure in Música de Cámara. 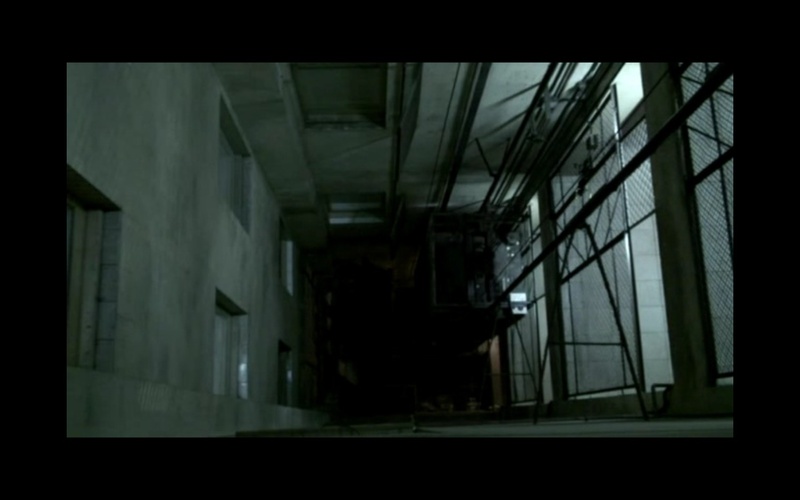 Video Tape’s Music (2008) by Fito Conesa (Cartagena, Spain. 1980). 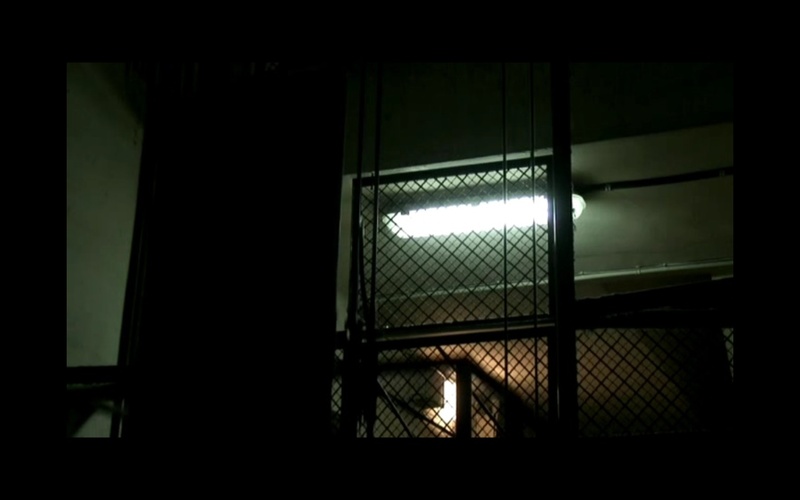 A videographic work in which the routine and seemingly meaningless movement of a lift between the ground and third floors of a building becomes a singular poetic action based on the dialogue between the images of cinematographic legacy filmed by Conesa and the musical soundtrack performed by the Portuguese musician Michael Leiria. 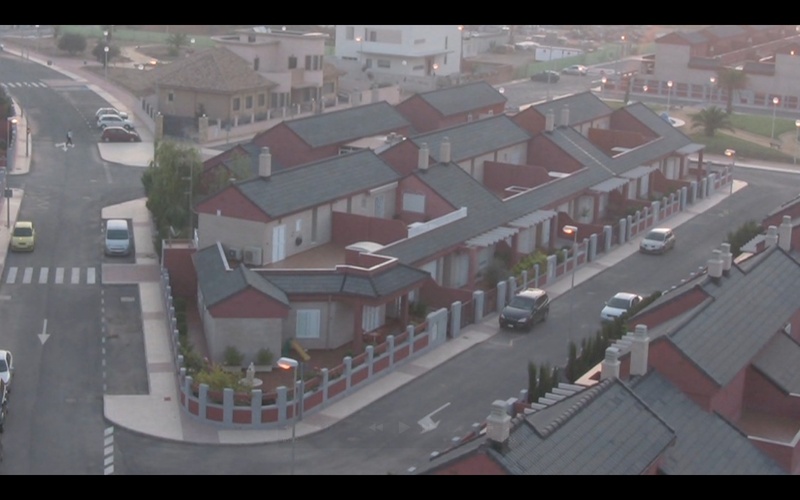 In addition, the exhibit includes Overture (2011), a video by Fito Conesa that, on this occasion, is set within a fixed plane that shows us an insignificant sunrise that could be located anywhere (in this case, a semi-detached houses in his native Cartagena) and is accompanied by the music of the saxaphonist Dani Nel-lo. It represents a new emotional encounter between image and sound in which the expectation created by the musical landscape explores the dramatic tension of a moment that is absolutely irrelevant. Dejando atrás la carga poética de los videos de Fito Conesa, nos encontramos con la concepción sarcástica y paródica del paso del tiempo que ofrece Una història de mediocritat (2011) de Pere Llobera (Barcelona, 1970). Una secuencia narrativa de 18 pinturas que, centradas en el relato visual de una cena entre amigos, exhibe irónicamente el patetismo implícito en el deterioro de una amistad que no se atreve a reconocer dicho fin. Un homenaje crítico a la experiencia frustrada que Llobera complementa con otra pieza de connotaciones antiépicas: La barca de gel (2012), un pequeño paisaje marino de herencia romántica en el que un bloque de hielo – alter ego del propio artista – se hunde irremediablemente en el mar. Un desdoblamiento antiheroico donde la noción trágica del naufragio funciona como declaración de intenciones sobre su manera de entender el arte. Leaving behind the poetic magnitude of Fito Conesa’s videos, we encounter the sarcastic and paradoxical conception of the passing of time that Pere Llobrera (Barcelona, 1970) offers us in Una història de mediocritat (2011). 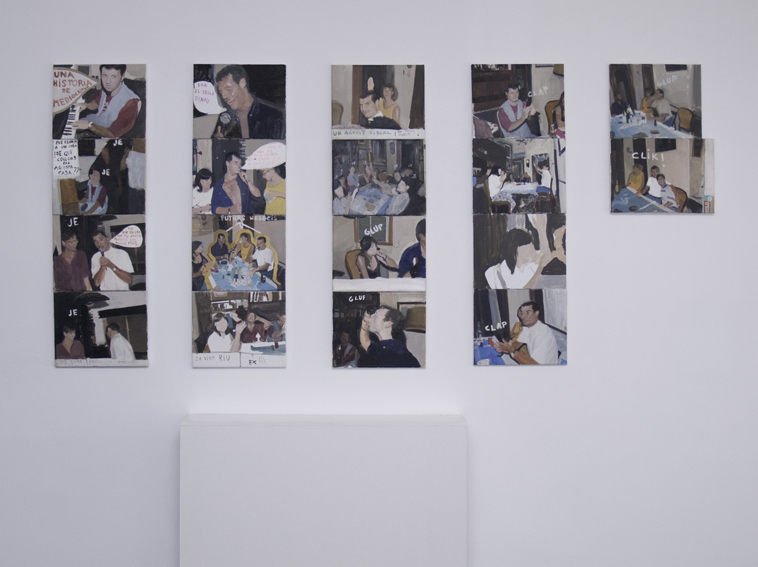 A narrative sequence of eighteen pictures that, focusing on the visual story of a dinner among friends, ironically exhibits the implicit pathos in the deterioration of a friendship that does not dare recognize its end. 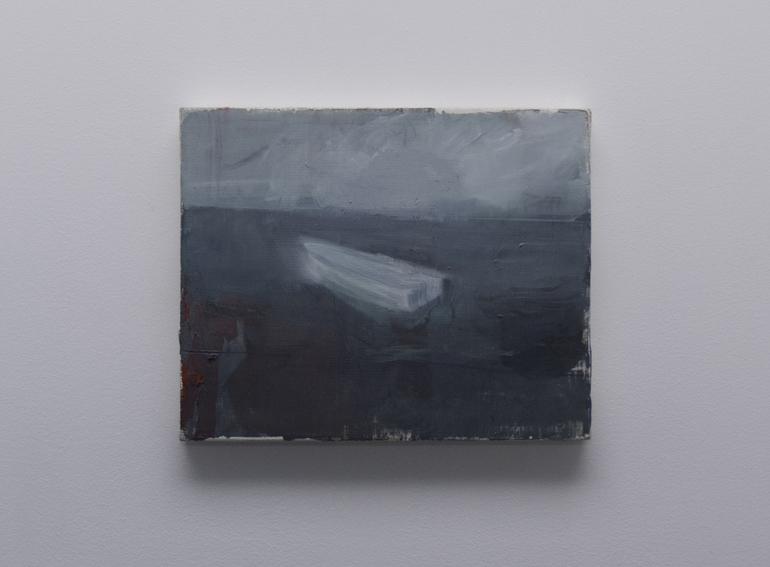 This critical homage to frustrated experience is complemented by another piece of anti-epic connotations: La barca de gel (2012), a small seacape in the romantic tradition in which a block of ice –the alter ego of the artist– drowns inevitably in the sea. An antiheroic duality in which the tragic notion of the shipwreck functions as a declaration of intent within his way of understanding art. Fake Memoirs (2008-2011) de Pedro Magalhaes (Oporto, Portugal. 1975) cuestiona la autenticidad de la vivencia y el recuerdo a partir de la fotografía analógica. Una obra a caballo entre la realidad y la ficción que toma prestado el concepto de “fake memoirs” (la falsificación literaria de recuerdos inventados) para crear un imaginario ficticio pero aparentemente real. Una suerte de autobiografía fingida y asentada en recuerdos falsos (un accidente, un paisaje urbano, un árbol muerto, un clip de mujer encima de una cama, un vómito en el suelo…), que explora la capacidad de la imagen para hacernos creer – o desconfiar – en aquello que vemos y reconocemos como propio. Fake Memoirs (2008-2011) by Pedro Magalhães (Oporto, Portugal. 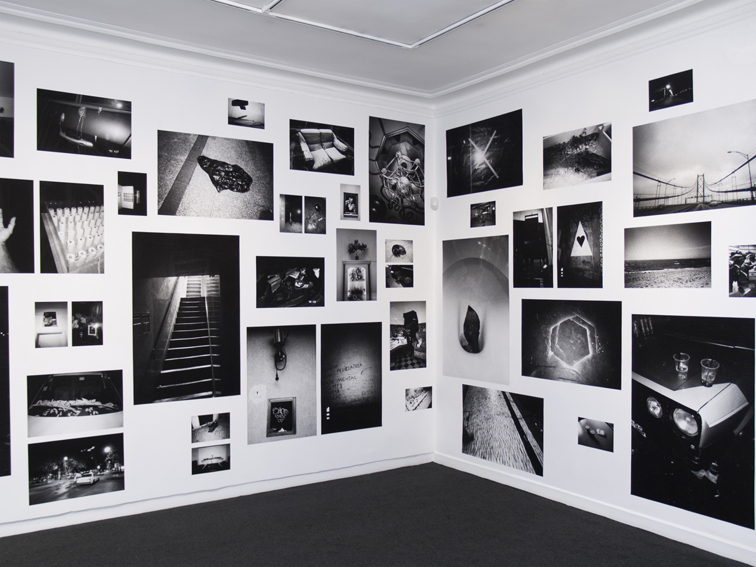 1975) questions the authenticity of experience and memories using dark room photography. A work that falls between reality and fiction as it borrows from the concept of “fake memoirs” (the literary falsification of invented memories) to create a fictitious imagery that is supposedly real. A fake autobiography based on false memories (an accident, an urban landscape, a dead tree, a clip of a woman on a bed, vomit on the floor…), that explores the ability of the image to make us believe or doubt those things which we see and recognize as our own. The Kappa Effect (2011) de Mafalda Santos (Oporto, Portugal. 1980) es una amplia colección de pinturas y piezas textuales presentadas en la galería Caroline Pagès de Lisboa en 2011. Una alusión directa a la percepción alterada del tiempo conocida en psicología como “efecto Kappa” – la ilusión temporal que trastorna el sentido de la distancia, el tiempo y la velocidad de una determinada experiencia – que da lugar, en este caso, a dos piezas distintas. Por un lado, The Kappa Effect #0, una pintura abstracta y simbólica en la que un conjunto de círculos concéntricos dibujan una representación del conocimiento a través de estímulos estratificados. Por el otro, Tales on Time and Space, tres obras de raíz textual donde los relatos fantásticos de los Cuentos del Espacio y el Tiempo de H.G. Wells son enrollados – y por tanto objetualizados – para generar, desde el lenguaje escrito, una nueva narración basada en los encuentros textuales azarosos surgidos del giro circular del papel. The Kappa Effect (2011) by Mafalda Santos (Oporto, Portugal. 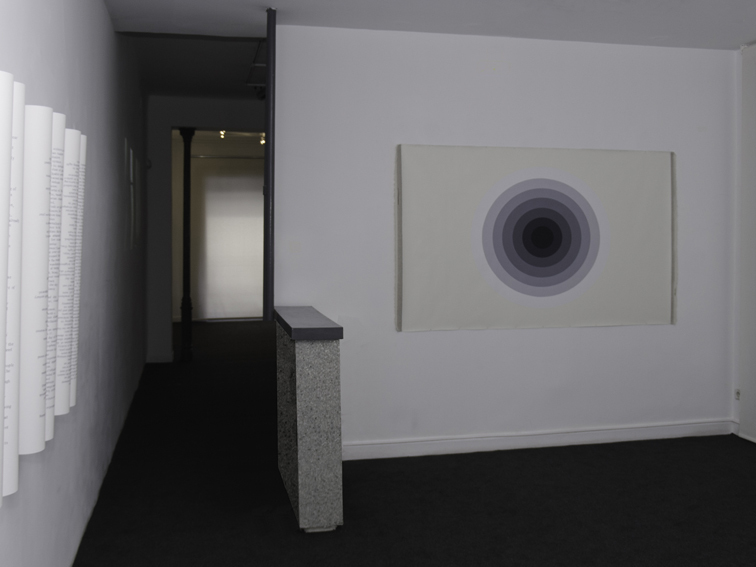 1980) is an extensive collection of paintings and textual pieces presented in the gallery Caroline Pagès in Lisbon in 2011. A direct reference to the altered perception of time known in psychology as the “Kappa effect” –the temporal illusion that disrupts the sense of distance, time, and the speed of a given experience– that gives rise, in this case, to two different works. On the one hand, The Kappa Effect #0, an abstract and symbolic painting in which a collection of concentric circles provide a representation of knowledge through stratified stimuli. On the other, Stories of Time and Space, three works with textual roots in which the fantasies from Tales of Space and Time by H.G. Wells are rolled up –and thus objectified– in order to create, from written language, a new narration based on the random textual encounters that arise from the circular turning of the paper. O começo do fim culmina con Into the Maelstrom de Zoé T. Vizcaíno (Ciudad de México, 1979). Un proceso de investigación sobre el remolino de agua más grande del mundo – la colosal cadena de vórtices de Saltstraumen Maelstrom en Noruega – que supone para la artista una aproximación emocional a los límites físicos y psicológicos de la experiencia visual extrema. Un fenómeno natural imposible de comprender en su totalidad que, desde una revisión actualizada del sublime romántico, nos sitúa entre la fascinación y el temor que suscita aquello que escapa de nuestro control y entendimiento. Un ejercicio de representación de lo irrepresentable – el movimiento centrífugo e infinito del torbellino marino – que da lugar a diferentes registros de documentación centrados en la fotografía y el video. 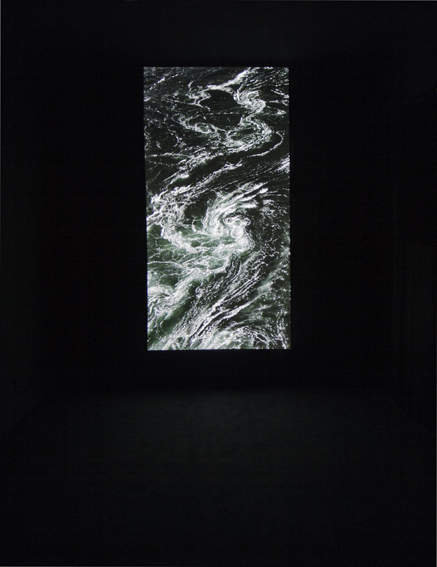 O começo do fim culminates with Into the Maelstrom by Zoé T. Vizcaíno (Mexico City, 1979). 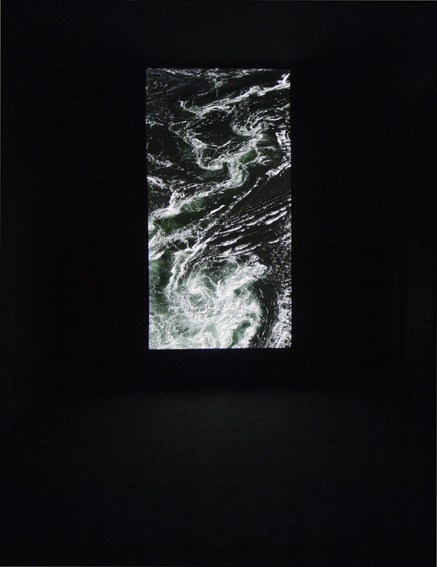 An investigatiion of the strongest tidal current in the world –the colossal Saltstraumen Maelstrom in Norway– which represents for the artist an emotional approach to the physical and psychological limits of extreme visual experience. A natural phenomenon that is impossible to understand in its totality, from an updated revision of what is romantically sublime, she places us in between the fascination and fear that is awakened by things that escape our control and understanding. 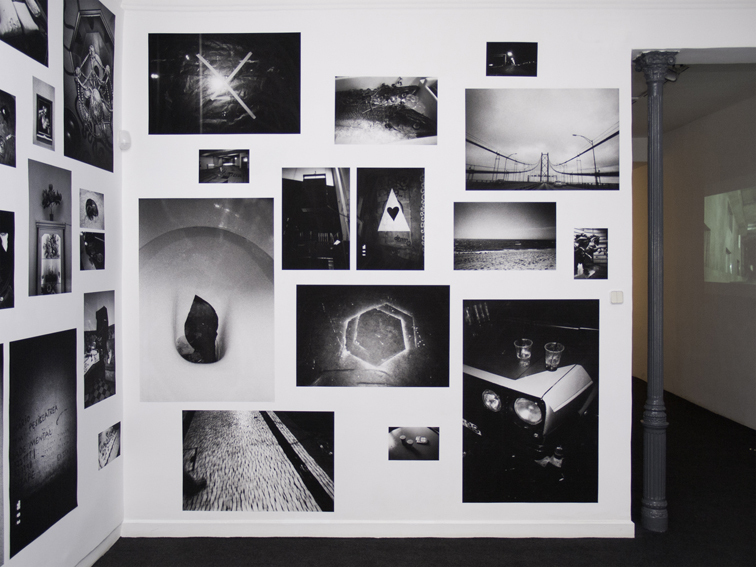 An exercise in representing what cannot be represented, the centrifugal and infinite movement of the tidal wave that gives rise to different recorded documents that are centered on photographic and video images.